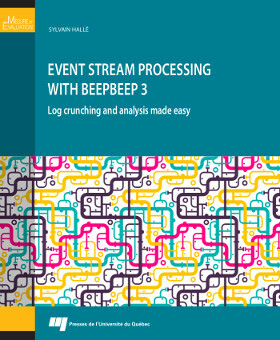 The book entitled Event Stream Processing with BeepBeep 3 was recently published by the Presses de l’Université du Québec. This manual, written by LIF member Professor Sylvain Hallé, is an educational introduction to the concepts of event stream processing. In a generalized way, a computer system can record all the events produced during its execution on a “tape” called a trace or a log. It may be desirable, for a variety of reasons, to look for events or sequences of events in this trace that could reveal a system malfunction. BeepBeep is a software library that has been under development at LIF for several years, and which allows a user to easily write programs that apply real-time processing to this kind of event streams. In the past, BeepBeep has been used to search for video game bugs, detect attacks in networks, analyze user behavior in a company, and identify electrical devices in a residence. The BeepBeep library has been the subject of numerous scientific publications in international conferences over the years. The publication of a first book dedicated to the system testifies to the maturity of the project and marks the beginning of a new phase in its evolution. This book, as well as the software itself, is available free of charge.